I have a pet peeve, recipe disappointments. I'm not talking about recipe fails, they are obvious. You take the dish out of the oven and you can see right away, something didn't work. I'm talking about recipe disappointments, those moments when you finish your recipe, stand back and think wow, that looks yummy. Then you bite into the dish and everything falls apart. While it may look beautiful, the taste is flat. Don't worry I'm not perfect by any means and have these experiences quiet frequently. Normally when they happen I try re-making the recipe with changes in order to figure out what exactly needs to be modified. It doesn't help when many food sites are moving to user based reviews. While I like the idea of reviews, they have a few issues. When you see that thousands of people like a recipe you assume it will turn out and when it doesn't you instantly feel like a failure. I think that is the root of the problem, the more positive reviews a recipe gets the more pressure you feel to give a positive review. With my reviews I try to be as honest as I can, when something doesn't work I relate how to change the ingredients or steps in order to make the recipe work. Today I tried a new recipe for Pumpkin Pancakes from the new All Recipes magazine which was one such experience. This recipe has 13 ingredients. It takes 40 minutes of total time, all of which is active and makes 12 pancakes. I made a number of changes to the original recipe and suggest even a few more. Perfect pancakes are something to be savored and I do my best to make delicious breakfasts. After struggling with pancakes for years I bought a griddle and haven't looked back. They are wonderful, no more gooey centers or burnt pancakes. I eat gluten free so I made two batches of these pancakes, one with gluten free flour and one as written. Either way I suggest a few modifications. The taste of the allspice is way too strong. It needs to be reduced to 1/2 teaspoon or less. The recipe does not include nutmeg, which to me helps reduce the strong taste of ginger and allspice in recipes. Additionally, the cinnamon flavor is hard to notice. I would suggest adding a 1/2 teaspoon of nutmeg, increasing the cinnamon and using buttermilk instead of milk and vinegar. The flavor would be much better. The pancakes end up too dense and heavy, which could be alleviated by only using baking soda or baking powder. Using both of them and too little liquid makes for a pancake that sits in your stomach for days. A thinner batter would help for the pancakes to be a little less hearty. I made these again with changes and they were much better. However, my two kids liked them either way, they ate both batches. For the second batch, which is pictured, I added chocolate chips. Both my kids and I preferred the chocolate chips since it mellowed the pumpkin taste. My family is an example of different food opinions, my boys loved the recipe as written, while I preferred it with changes. Food as with many things in life, is relative. It's totally subjective, isn't it? That's the beauty of a recipe, I suppose...they can EASILY be tweaked to our own tastes. Anyhow, those pancakes look soooo good! It really is subjective :) They turned out really well with the changes! I make these pumpkin ones and sweet potato ones and my son loves them! He says that they are better than regular (buttermilk) pancakes! I love sweet potato pancakes, yum! I saw your cookies, they look yummy! I haven't made pumpkin bread since last fall, I love it though :) Griddles are the best, I will never go back! I'm saving this recipe for Thanksgiving because I don't normally have 40 minutes to make breakfast. :) Love the presentation of the chocolate, look totally yummy!! You can prep it the night before :) I do that a lot during the week or I make them on weekends, freeze them and then stick them in the toaster oven to reheat! oh my...all of my (our) favorites here! pancakes, pumpkin, and chocolate chips! i've had many failed recipes, but always do read the reviews for modifications and suggestions like yours! i really do want to try this! will be bookmarking this one! thanks! btw, what time is breakfast at your place, hee hee! I read the reviews often too :) Or I wing it as I go and write down the modifications that I make. I am really bad about following recipes exactly as written, I tend to change at least one or two things. I make pancakes on the weekends and have made pumpkin ones before. I like the flavor, but as you said, sometimes you need to tweak the recipe to suit your tastes. Same can be true for many recipes out there. I make a lot of pancakes on weekend too, they are a great weekend breakfast food :) I like the flavor of pumpkin pancakes, these were just too high on the allspice. I have a lot of canned pumpkin in my cupboard too! 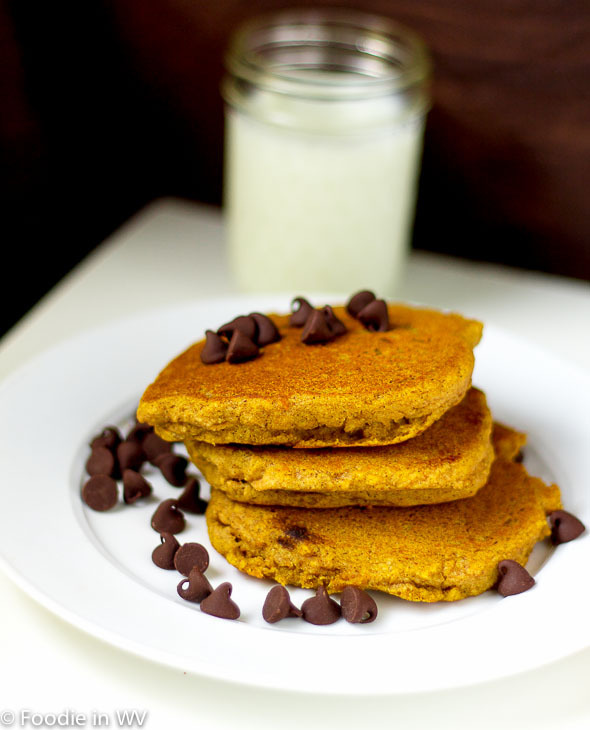 I've had pumpkin pancakes before - this is a great use for canned pumpkin. I agree that it is a good use for canned pumpkin! These sound amazing! My family loves pumpkin, I will definitely have to try these! Thanks for sharing! They would be great for breakfast in bed, I agree! It is yummy and really good for you too! Hello! I completely just pined your recipe! Thank you for sharing! I enjoy your blog very much! Thanks for the pin and the sweet comments! I'm always trying to clear out my pantry. Great idea for pancakes. Thanks for sharing this with us on foodie friday. I love a good pancake recipe. Sadly I do not make pancakes often. When I do though, I like going different. Sweet potato is one of my favorite types, and with that, I'm surprised that I have never tried pumpkin. I will definitely give it ago and try your enhancements. Thanks for sharing! Pumpkin pancakes can be very yummy I promise :) I don't make pancakes very often either, but I love them with I do! Pumpkin pancakes are a favorite in this house all year round! I love them year round too! I love pumpkin too, it has such great flavor!